Graphotrade is a preferred partner of Presstek in Bulgaria - Presstek's core product portfolio includes 4- to 6-color DI digital offset presses and waterless printing plates. Other offerings include CTP hardware and a wide variety of plates for commercial applications. Presstek is a multi-vendor service provider with a global network of expert service technicians supporting pre-press, press, and post-press equipment including Presstek brands and many of the industry’s well-known brands. Presstek There are 2 offers. 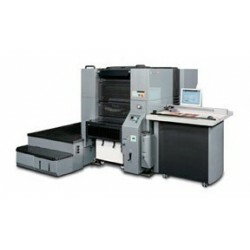 PRESSTEK 34 DI Our 34DI 4-color digital offset press is an extremely compact, efficient, high resolution printing system offering a low cost per page for your short-run printing needs. Owning a DI means you don't need to produce metal plates and you don't need to invest in a CTP system.